Mignon and Daniel, contemplating chocolate. I couldn’t get them all to stand still for long enough! On Sunday we had most of the family over for lunch to celebrate my Mom’s birthday and my Dad kindly offered to take out Isabel’s first tooth. With pliers. Don’t even ask, I hid in another room. Instead of wailing Isabel was so chuffed with her first tooth out, she didn’t even care. I’ll just put another few SA Ront in the Therapy jar for later. Just in case. Daniel came along, so it was 3:1, always fun. I, of course, went at the busiest time of day, when everyone was popping in to grab something for supper, but this did not deter our children. Oh no, they ran from shelf to shelf, fridge to freezer. They compared prices, added up how much money they would have left and, how many things they could buy. With EVERYTHING. 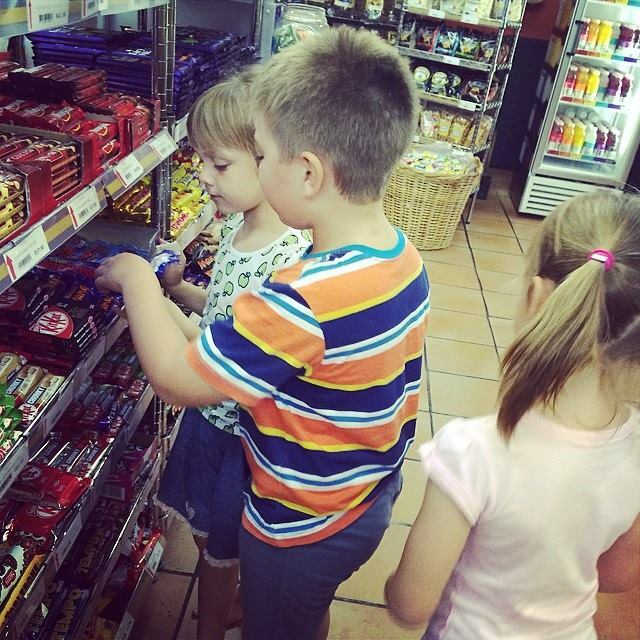 I was so completely wrapped up in them and the serious discussion and group calculation of a R15 purchase of Milk Straws vs the 10 Easter Eggs they could each get for their R20 and to see how their minds worked overtime that I didn’t notice how people were watching us until we got to the till. There were some very amused faces as I looked up and even a slightly grumpy old man that tried to push them along at the till. That almost made me go into full Mother-Hen Clucking mode. I wanted them to put their chosen items down themselves and hand over the money. The looks of joy and pride on their faces were priceless, even the cashier played along when I had to substitute with the odd Rand here and there. Even the grumpy old man got the message and backed away eventually. I may just have glared a teeny weeny tiny little bit.. It was, in the bigger scheme of things, a tiny little thing to do with them, but I am blown away day after day at how different they are and how they each view the world. They are suddenly all independent and have so much figured out already, it makes me fall in love with them more every single day. * they SO did not pay me to say that, clearly there’s no benefit in me writing about it here. But, the staff there are always amazing and they will go out of their way to find you anything you ask for, even if it is a random type of yeast from Bulgaria. Back to normality, whatever that is.. Very cute! In general ours take the few ront and add it to their savings pot (They get R20 for tuck shop on Friday – what they do not use they can save for bigger stuff.) I love how they think what to spend it on and how they save for things.